When you wear a pair of Charles Tyrwhitt men’s shoes, you’ll notice that quality is inherent in every detail; from the smell of the leather, to the craftsmanship in the stitching, and the shine in the finish. Whether it’s classic Oxfords or jazzy penny loafers, here at Tyrwhitt HQ we’ve got a range of men’s footwear guaranteed to suit every gent’s taste. 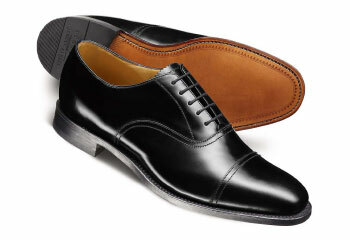 A pair of smart Oxford shoes is a must-have for every gent. Oxfords are leather shoes that have enclosed lacing, meaning the shoelace eyelets are stitched underneath the top section of the shoe to create a cleaner, more formal look. Originally from Scotland and Ireland, traditional Oxfords have a plain upper, although some modern styles may have small decorative patterning. Oxfords are popular due to their versatility and timeless design, making them the perfect men’s dress shoes for business events, weddings and swanky evening dos. The Derby shoe is similar to the Oxford shoe, but there’s one important difference: while Oxfords have enclosed lacing, Derby shoes have open lacing (unstitched at the bottom). Derbies were a popular choice for hunting and sporting footwear during the 1850s, and in the 20th century the style began to make its way from the country into towns. Derbies today are a little less formal than Oxford shoes, but will still work a treat at nice restaurants, boardrooms and members’ clubs alike. Brogues originated hundreds of years ago in Scotland, when locals would punch holes in their shoes to let water drain out as they walked through boggy land. Over time, the perforations became less functional and more decorative, evolving into the elegant broguing patterns commonly worn today. 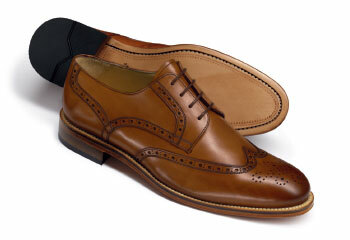 A full brogue is sometimes called a Wingtip because of the distinctive “W” shaped pattern on its toe. 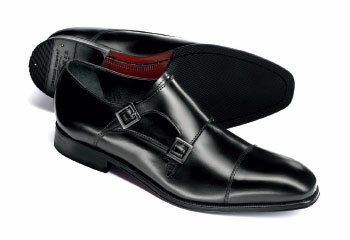 Monk shoes have no lacing; instead they are fastened with a buckle and strap. The name “monk” comes from the European monks who originally wore these leather shoes as a protective alternative to sandals. Monk shoes are relatively formal and come in variations with single or double straps. They’re suitable for most occasions and can be used to add panache to an outfit that needs an extra touch of flair. 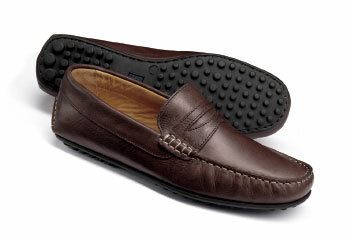 Loafers are low slip-on leather shoes with no shoelaces or buckles, similar in construction to moccasins. Some say the first men’s loafers were designed as slippers for King George VI of England, and the style then became popular with Americans in the 1930s. Loafers are versatile shoes that will look just as good with chinos and a washed Oxford shirt as they will with a Summer suit. 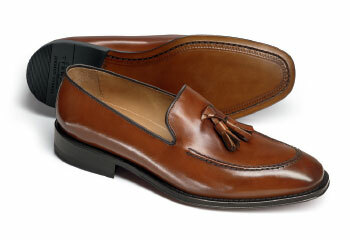 Variations include the penny loafer (with a slit in the upper), the tassel loafer, and the plain front. Tyrwhitt loafers are exceptionally comfortable; perfect for Summer business meetings, golf games and garden parties. 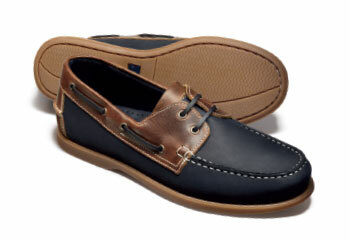 The first boat shoe was invented in the 1930s by Paul Sperry, an American sailor and outdoorsman. After studying the way his dog was able to run easily on ice, Sperry invented a shoe for sailors with siping on the sole (thin slits cut into rubber) to prevent slipping on boat decks. Today’s boat shoes feature soft rubber soles in white or brown. They’re arguably more casual than loafers and therefore ideal for the weekend or holidays. 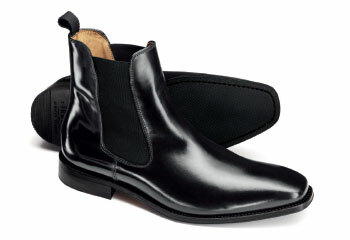 Chelsea boots are ankle-high with elastic sides that allow the boot to be slipped on and off easily. They were worn for horse riding in Victorian times, then witnessed a rebirth during the 1960s British mod scene when they were made popular by style icons such as the Beatles. Today, Chelsea boots for men are simple, versatile shoes suitable for smart casualwear and occasionally even worn with a suit. 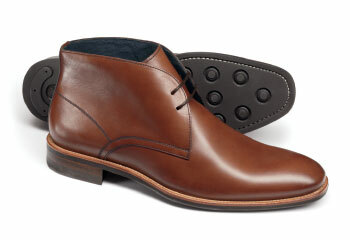 Chukka boots have a rounded toe, minimal stitching, and open lacing with two or three pairs of eyelets. Because a Chukka boot will fit more snugly around the ankle than a Chelsea boot, this style can be worn underneath jeans or close-fitting trousers. Chukka boots are simple and versatile, making them a popular choice for business casual, weekend wear, and everything in between. 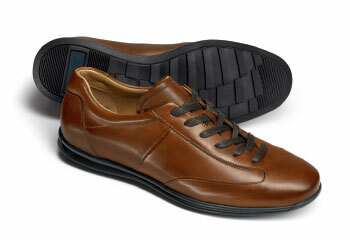 Our leather work trainers are designed with comfort in mind, but they’re also smart enough for the office. Featuring hardwearing rubber soles and a solid construction, Tyrwhitt work trainers are as durable as they are stylish. 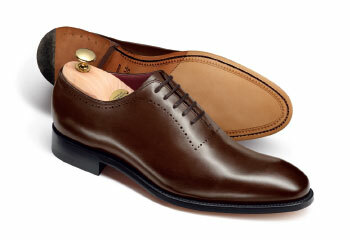 The ultimate in elegant footwear, our wholecut shoes are made from a single piece of luxurious high quality leather. 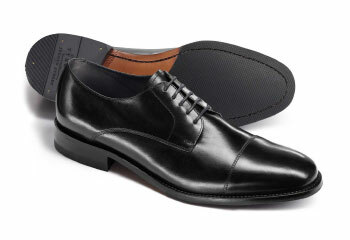 Because they have almost no visible stitching, wholecut shoes have a flawless and formal look. The slim shape, clean lines and smooth upper are just the right combination for minimalist refined style that will fit the bill perfectly for any formal occasion. A casual variant on the loafer, driving shoes were originally designed as shoes for racecar drivers (since larger clunky shoes were impractical for driving). These slip-on shoes have a flexible lightweight construction – similar to a moccasin – that makes for comfortable footwear in which one can easily navigate a car’s pedals. Tyrwhitt driving shoes have a segmented gripped rubber sole and a soft unstructured look, so they’ll go perfectly with shorts or light trousers on a Summer day.